My name is Aimee Strunk-Reinoehl. 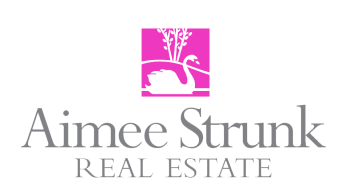 Thank you for taking the time to visit Aimee Strunk Real Estate . I have been a Realtor since 2000. I was about 10 years old when my mother, Lynn Strunk, began her career in Real Estate. I can recall taking long car rides with my mother to search for “For Sale” signs and busy local contractors, who could only be found on site, as there was no internet and no cell phones! Technology has made all of our lives so much easier, and we embrace it at Aimee Strunk Real Estate. However, basic principles, such as listening to our clients, face to face encounters, community involvement, and our willingness to preview properties for our clients, are still at the core of what we do. As a certified Real Estate instructor, I have a passion for educating both students and consumers. It’s an ever changing industry. I believe making informed choices leads to a happy outcome. I had the pleasure of working with Aimee for the sale of my home, which had been in my family for five generations. Aimee took the time to sit down and talk with me and listened to a proud history of my home. She went above and beyond to ensure the showings and resulting sale were done in a fashion that made it easier on my heart strings. She was always available for a phone call or text and answered all of my questions fully, even the ones I asked several times. Her many years experience was proven to be beneficial and I would highly recommend Aimee to be your realtor. I'm sure you will be as satisfied as I am.